Visiting Tremblay-en-France and seeking for a place to swim? Nice option! Don't forget to tell us how did it go. 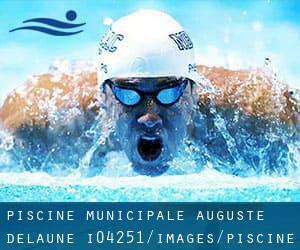 Introducing now Piscine Municipale Auguste-Delaune swimming pool, an awesome swimming pool sent by a swimmer like you couple of days ago. Have you visit this pool? Do you work here? Please, contact us when you have facts that you feel is gonna be useful and remember from now on you'll be able to now promote every single pool just by sharing this page with your buddies or adding comments in the Facebook boxes below. Come on and assistance this pool to be the first in Tremblay-en-France! Among all the activities offered by the center, if you are thinking about swimming you might get pleasure from 25 meters x 8 meters, 4 lanes, Indoors. Just in case you want to make contact with this Swimming Pool before dropping by, we only know the phone number. Write down the GPS coordinates we've on our file for this Pool, so you can enter them into your GPS to support you locate the Aquatic Center easily. If you believe that any on the info is incorrect, please get in touch with us. Assistance us be better day-by-day. Updated on 2019 Parc de la Mairie , Livry Gargan , FRANCE (Postal Code: 93190). Among all the activities offered by the center, if you are interested in swimming you will appreciate 25 meters x 12.5 meters, 5 lanes, Indoors. Just in case you would like to get in touch with this Swimming Pool just before dropping by, we only know the phone number. Updated on 2019 207 Avenue Gallieni , Bondy , FRANCE (Postal Code: 93140). Swimmers like you reported 25 meters x 12.5 meters, 5 lanes, Indoors. Unfortunately we do not have the email address of this Swimming Pool, but we can give you the phone number. Updated on 2019 Rue Edouard Poisson , Aubervilliers , FRANCE (Postal Code: 93300). Among all the activities offered by the center, should you be thinking about swimming you can enjoy 25 meters x 15 meters, 6 lanes, Indoors. If you will need to contact this Swimming Pool, email address and phone number are both number. Updated on 2019 31 Rue Jean Baptiste Semanaz , Le Pre Saint Gervais , FRANCE (Postal Code: 93310). Among all the activities provided by the center, if you are interested in swimming you will enjoy 25 meters x 10 meters, 4 lanes, Indoors. Just in case you desire to get in touch with this Swimming Pool prior to dropping by, we only know the phone number. Updated on 2019 Rue de Saint Gratien , Drancy , FRANCE (Postal Code: 93700). Among all of the activities offered by the center, should you be thinking about swimming you may enjoy 25 meters x 15 meters, 6 lanes, Indoors. Just in case you would like to contact this Swimming Pool before dropping by, we only know the phone number. Updated on 2019 21 Rue Edouard Vaillant , Montreuil sous Bois , FRANCE (Postal Code: 93100). Swimmers like you have reported Olympic size x 20 meters, 8 lanes, 1.2 meters - 5.8 meters depth, 1.2 meters - 5.8 meters depth, Indoors. Also, you will find 20 meters x 15 meters, Indoors. Just in case you want to contact this Swimming Pool prior to dropping by, we only know the phone number. Updated on 2019 Rue Jardins , Le Bourget , FRANCE (Postal Code: 93350). Among all the activities offered by the center, should you be thinking about swimming you can enjoy 25 meters x 12.5 meters, 5 lanes, Indoors. Just in case you would like to contact this Swimming Pool just before dropping by, we only know the phone number. Updated on 2019 26 Avenue Thiers , Le Raincy , FRANCE (Postal Code: 93340). Swimmers like you reported 25 meters x 12.5 meters, 5 lanes, Indoors. Unfortunately we do not have the email address of this Swimming Pool, but we can give you the phone number. Updated on 2019 Avenue Jules Guesde , Stains , FRANCE (Postal Code: 93240). Swimmers like you reported 25 meters x 12.5 meters, 5 lanes, Indoors. Unfortunately we do not have the e-mail address of this Swimming Pool, but we can give you the phone number. Updated on 2019 3 avenue Jean Moulin , Saint Denis , FRANCE (Postal Code: 93200). Swimmers like you reported 25 meters, 8 lanes, Indoors. Phone number and e-mail address are number for this Pool. Updated on 2019 2 Bis Chemin Tortu , Neuilly Plaisance , FRANCE (Postal Code: 93360). This sports center offers 25 meters x 10 meters, 4 lanes, Indoor/Outdoor. For this Swimming Pool, only phone number is number here. Updated on 2019 59 Avenue Gallieni , Petit Noisy , Noisy le Sec , FRANCE (Postal Code: 93130). Among all the activities provided by the center, for anyone who is enthusiastic about swimming you will get pleasure from 25 meters x 15 meters, 6 lanes, 2 meters - 3.5 meters depth, 2 meters - 3.5 meters depth, Indoors. Just in case you want to contact this Swimming Pool before dropping by, we only know the phone number. Updated on 2019 14, Chemin Mare aux Poutres , Sevran , FRANCE (Postal Code: 93270). Among all the activities supplied by the center, when you are considering swimming you may appreciate 25 meters x 15 meters, 5 lanes, Indoors. Just in case you wish to contact this Pool before dropping by, we only know the phone number. Updated on 2019 202 Avenue Marechalde Lattre de Tassigny , Les Lilas , FRANCE (Postal Code: 93260). Among all the activities provided by the center, in case you are interested in swimming you will enjoy 25 meters x 10 meters, 4 lanes, Indoors. Just in case you want to contact this Swimming Pool prior to dropping by, we only know the phone number. Updated on 2019 Rue Jean Bouin , Gagny , FRANCE (Postal Code: 93220). Among all the activities offered by the center, if you're keen on swimming you may appreciate 25 meters x 15 meters, 6 lanes, Indoors. Just in case you need to get in touch with this Pool before dropping by, we only know the phone number.